An old artist friend of mine is looking for an antique sewing machine to paint. I offered him my Jones but he’s looking for one with legs. Does anyone know of such a machine within reasonable distance of Oxford or London that he could have access to for a couple of hours? If you do could you leave me a message below? You may remember that a few months ago I had a (significant) birthday. What I didn’t tell you was that Hugo, my lovely partner, decided to give me a new sewing machine! I spent a lot of time trying to decide which one to go for and eventually settled on this – a Janome DC3050 from John Lewis. Automatic threading – yes, for those of us with poor eyesight this really is a godsend. There is a little bar that you pull down next to the needle, you pass your thread over the bar and the machine sends a tiny little hook through the needle’s eye which threads it automatically. So clever, I think the machine is worth it for this alone! Auto thread tension – I didn’t really pay much attention to this when I decided to buy the machine, but it is a godsend! What auto thread tension means is that it handles any fabric without you having to fiddle around with the tension – perfect stitching every time. I have had a couple of problems. Firstly, I tried using top stitching thread and found it didn’t really like it. 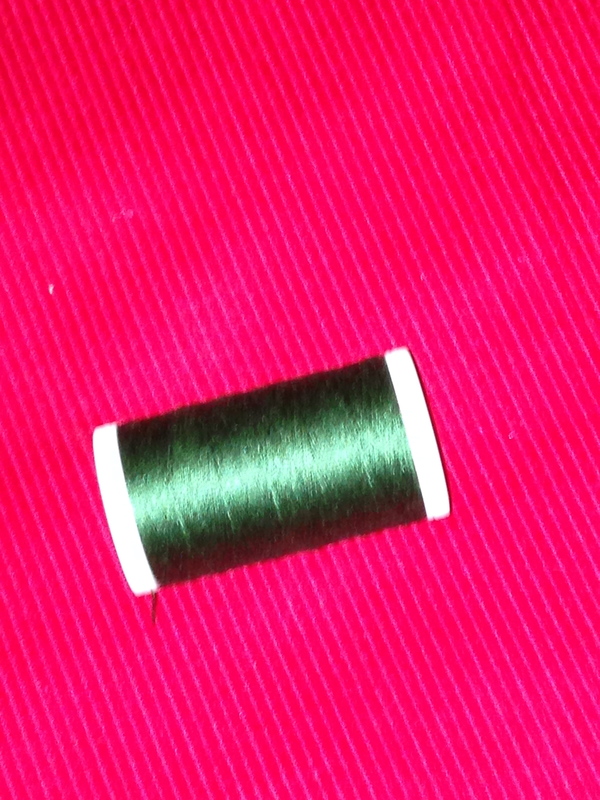 I put the top stitching thread in the needle but used ordinary thread in the bobbin. It did manage to get some pretty good stitching but a couple of times it pulled the bobbin up out of the case, which can’t be good. Secondly I wanted to try using a twin needle, it’s advertised as being suitable for a twin needle but the instruction manual doesn’t tell you how, the big problem is that I can’t see where you put your second reel of thread. I’m planning to ask John Lewis to advise me on this one. Anyway I couldn’t ask for a better present and if anyone is thinking of buying a new machine I can definitely recommend this one. I seem to have so little time these days for anything. I leave for work, on my bike, at 7 in the morning and am rarely home before 8. We’ve been busy doing fund things at weekends and also are in the midst of building works. I’m loving every minute of it so I’m not complaining, but all this activity has left very little time for sewing and even less for catching up on reading blogs or writing my own blog. Today I had a spare couple of hours. It wasn’t enough time to make anything but it was enough to allow me to do some cutting out. My theory is that cutting is one of those jobs that has to be seen through to completion, whereas once I have the cloth cut I can probably sew it up in lots of short burst. Well that’s the theory anyway, we’ll have to see if it works out in practice. So what did I cut out? Well, first of all I decided to make some more Tessuti Suzy Pants. I love the style of the ones I made a few weeks ago and they are some of the most comfortable trousers I own (is it giving up to love elasticated waists? personally I think it’s ok providing you don’t make a habit of wearing them all the time). This time (I’m so proud of this) I used fabric from my stash! When I first started sewing and knew absolutely nothing I found a pattern for a dress that said it could be made out of silk velvet. 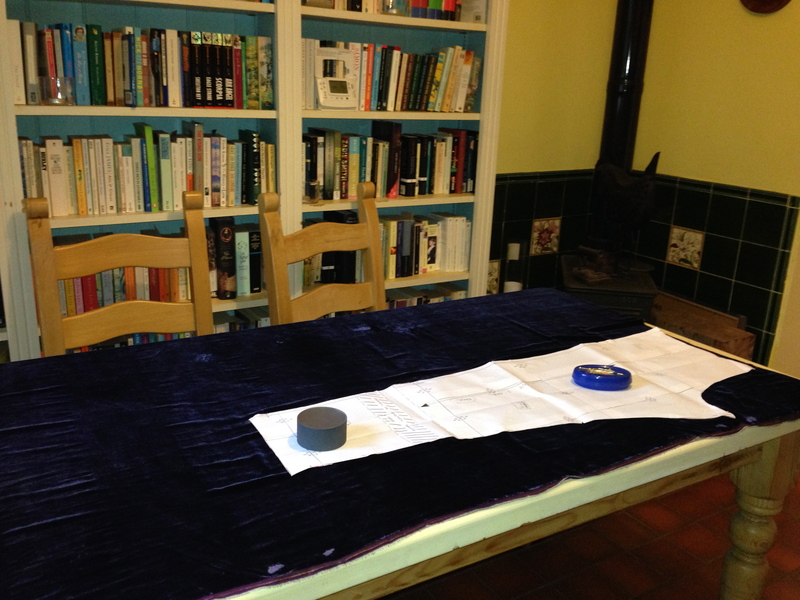 Loving silk velvet I rushed out to Goldhawk Road (my first trip there) and bought 3m of a lovely dark purple fabric. Once I got home and started to read up how to make the dress I realised that a silk velvet bias cut dress was hardly a beginners project. I also went off the pattern completely, in retrospect it really was a pretty boring sort of dress and not one I would have ever worn, even if I had been able to make it. So, cut forward several years (3? 4? ), and I still have the silk velvet. A few months after I bought it, I read somewhere that you should not fold and stack velvet but should hang it. I checked the velvet and, although it had been sitting under a pile of other fabric, still looked perfect, but just to be on the safe side I refolded it carefully and hung it in the wardrobe on a skirt hanger. Well, when I came to unfold it I found that this was possibly not the best thing to have done and I had all sorts of funny creases in odd places and odd marks where the hanger pressed against it. I’m not sure whether this would have happened if I had left it in my pile – it could just be because it was so old. Anyway, by cutting the fabric in one layer with the fabric right side up so as to avoid the bad bits, I managed to get the trousers cut out. Silk velvet is quite slippery so I probably would have cut it out in one layer anyway. The pattern is very simple, there were only 10 pieces to cut out, so it didn’t take long. Next up, I decided to cut out another Vogue 1247. My last one was made out of some very cheap and not very nice cotton moleskin. Actually, it’s not as bad as all that, it’s just got a bit scruffy over the last year, the black moleskin seems to be a fluff and dust trap and no matter how many times I wash and brush it, it never seems very clean. On a roll I consulted my stash again and came up with some cherry red needle cord from Truro Fabrics. It is the most fabulous colour (the picture below doesn’t do it justice) but the fabric itself is a little light weight. I probably bought it in June or July so it’s not really been in the stash that long. I usually wash my fabric when I buy it so it’s already when I feel the mood to use it, but for some reason I’d forgotten to do it this time so it was still sitting in the plastic bag Truro supplied it in. As I got it out of the bag a reel of thread fell out. Truro give you a free lucky dip reel with all purchases and in the past it’s always matched my fabric. This time, as you can see, they seem to have gone with a contrast colour – very odd but it will do for basting. Anyway that’s my news for today. Have you been sewing anything exciting recently?